Most of us relate to Buddhism through meditation practice and our interest in relieving stress, anxiety, and other forms of psychological suffering. In The Path of Profound Kindness – a weekend program taught at the Toronto Shambhala Centre by Shambhala Buddhist teacher Jay Lippman – we learned that Buddhism offers us much more than that. It includes many contemplative practices that can transform our fundamental relationship with our world and help us become wiser and more compassionate people. A long-time student of the late Chogyam Trungpa, and now of Sakyong Mipham, Jay Lippman is also a student of the great yogi/scholar Khenpo Tsultrim Gyamtso. At the request of Khenpo Rinpoche, Jay has been teaching a series of courses that are designed to clarify key points of Buddhist teachings for Western students. 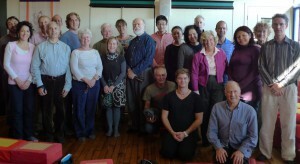 Karma – the first in this series of courses- was offered in Toronto in 2010. The Path of Profound Kindness focused on the Buddhist teachings of compassion or bodhicitta. Introducing these teachings by way of a broad, historical overview, Jay described the evolution of Buddhism throughout Asia. In particular, he recounted the emergence of the Mahayana schools of Buddhism with their emphasis on the figure of the Bodhisattva — a practitioner who is dedicated to overcoming suffering for the benefit of all sentient beings. The key teachings of the Mahayana – literally translated as “the great vehicle” – are twofold: wisdom and compassion. On Saturday, we were introduced to the Buddhist conception of wisdom and, more specifically, the teachings on emptiness. Difficult to understand or grasp intellectually, emptiness is in fact beyond concept. Jay emphasized that it is a direct and sudden experience of the ultimate nature of reality. It refers not as is often thought to nothingness or non-existence, but to a liberation and freedom from attachment or grasping — the source of all suffering. Compassion arises out of this experience of emptiness. It can also be cultivated gradually through specific contemplative practices. On Sunday, Jay introduced the practices of loving-kindness and compassion. In these practices, we start by taking the compassion our mothers had for us as our object of meditation. Holding this feeling in our hearts we extend it beyond ourselves to others and ultimately to the whole world and all sentient beings. Talking with Jay Lippman in the community room. A signature feature of Jay’s teaching style is his sometimes pointed, but always friendly, insistence that we not stay with our preconceptions of Buddhism. All too often these only serve to make Buddhism “safe” and confirm us in our current beliefs. Rather, the Buddhist teachings are something we should take quite seriously and as a challenge. They rub against the grain; and we should really mull them over and chew on them, Jay says, so we can start to experience their transformative power. Perhaps more than some Shambhala courses, which are more experiential in nature, Jay’s include quite a bit of conceptual exposition and argument. In this, he seeks to introduce us to the rich tradition of Tibetan Buddhist thought which is only beginning to be understood in the West. Jay based this course on a commentary by Khenchen Thrangu Rinpoche on The Jewel Ornament of Liberation by the twelfth-century Tibetan teacher, Gampopa. Known as a “lamrim” text (a Tibetan word for “stages of the path”), this book describes the entire Buddhist path from initial motivations to complete enlightenment. While perhaps more intellectual in focus, the point was never lost that this course was not about collecting concepts or information. Instead, study and practice were joined together, inspiring us to really work on changing ourselves so we become kinder to ourselves and others.